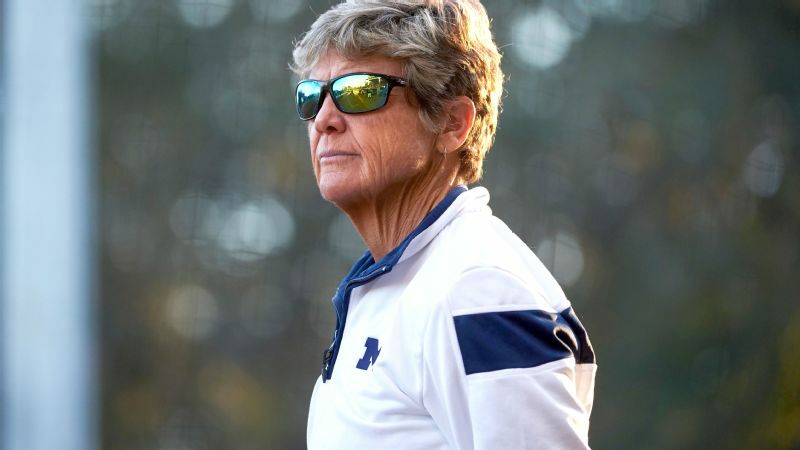 Before she became the legendary softball coach at Michigan, Carol Hutchins fought a Title IX battle when she was a student-athlete at Michigan State. It was 1976, and Carol Hutchins was a freshman basketball player at Michigan State. She and her team were practicing for a rare game to be held in the main gym, Jenison Field House, as part of a doubleheader with the men when the Michigan State men's opponent arrived on the floor. "You've got to get off the court," the coach told the women, according to Hutchins. "You need to get off this court," he repeated. "Because nobody gives a damn about women's basketball." If you want a singular moment when Hutchins and her teammates went from happy-go-lucky to pissed off -- and decided to take action that would transform athletics at the school -- this was it. 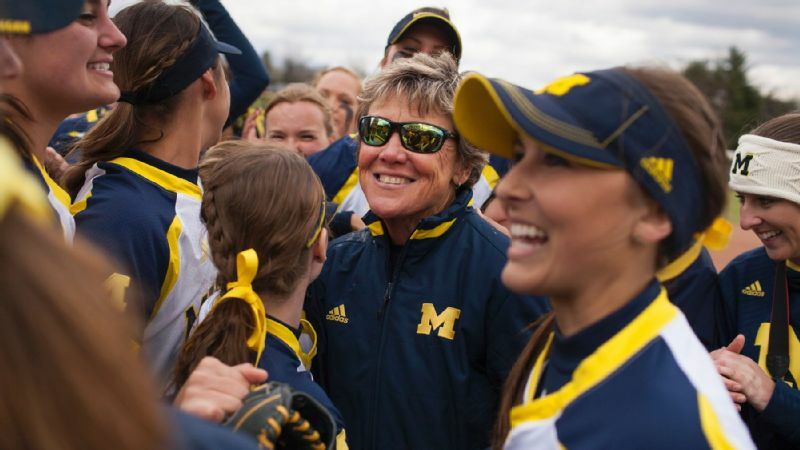 "It was pure venom after that," says Hutchins, now the softball coach at Michigan. "It was the first time I thought, 'You son of a b----. We deserve better than that. Why are you more important than us?' It was like poking the bear." That bear eventually became the winningest coach in softball history. Hutch, as most of her players call her, is a living, breathing Title IX case study. This week marks the 45th anniversary of the passing of the landmark legislation, which happened just as Hutchins became a high school athlete. By the time she was a senior in college, she had filed a lawsuit against her school to improve conditions for female athletes. And today, she makes sure her players don't take the opportunities they have for granted, because women, including Hutchins, fought for those opportunities. "Things don't happen on their own because athletic directors decide to do the right thing. The law makes a big difference," says Marissa Pollick, a lecturer in sports law at Michigan, an attorney at Shumaker, Loop & Kendrick and a Title IX expert. "It's been a struggle for 45 years." Growing up in Lansing, Michigan, in the 1960s, Hutchins was raised to believe she was not equal to her two brothers, at least in regards to athletics. "I didn't understand why I couldn't do everything my brothers did. My mom used to tell me, 'Girls don't want to play sports.' Everybody used to say that." The eventual four-year letter-winner for Michigan State's softball team and the sport's all-time winningest coach didn't even play in high school. She couldn't; there was no team. Girls were expected to get their exercise through cheerleading, which is what Hutchins' two sisters did. Hutchins tried, but she got kicked off the team for playing basketball. During a high school summer, she joined an adult softball league, riding to games and nightly practices on her bike. Finally, during her senior year at Everett High School (while a male student named Earvin Johnson was garnering national attention and a nickname), varsity basketball was offered to girls for the first time, thanks in part to Title IX. Hutchins recalls the announcement in the local paper reading something like, in her words, "We're going to put the girls in the fall so they stay out of the way of the boys [in the winter]." But it was a real team, not a group of girls playing four or five games against other schools thanks to sympathetic gym teachers. "The most exciting thing that ever happened to me was getting a real uniform," says Hutchins. Her parents thought Hutchins would ultimately opt for Lansing Community College, which offered scholarship money. But Hutchins decided to attend Michigan State, taking out loans and working a night job answering phones at the school. "There's always a solution," Hutchins says, echoing a sentiment she shares with her players today. "Don't focus on the iceberg. Focus on the direction of the ship." By 1978, Hutchins was the captain of the Michigan State basketball team and a star on the softball squad. But while the Spartans' men's team -- including Magic Johnson -- traveled to games via chartered buses or planes, ate at real restaurants and slept two to a room, the women's teams were driving themselves in station wagons, eating McDonald's every meal and sleeping four to a room. "The inequities were stark in every way," says Kathy DeBoer, Hutchins' basketball teammate who was also a volleyball player and is now the executive director of the American Volleyball Coaches Association. The basketball players' attitude? We're done with this. We're going to fight because we can win. They hired Jean L. King, a lawyer who took on the case pro bono. "The law only works if you use it," Hutchins remembers King, who became a Title IX advocacy legend, telling them. "If you stick it out, you will win." Hutchins v. Board of Trustees of Michigan State University landed on the desk of Lou Anna Simon, who is now the school's president but at the time was the assistant to the president. She was leading a committee that monitored Title IX compliance and says that an athletics-wide review was already underway at the time of the lawsuit. "[The internal review was sparked] by trying to do the right thing," Simon says. "I wasn't unaware of the concerns [about women's sports]. I was one of the few people who went to watch women's basketball games. The lawsuit was dumped in the middle of [the review] out of frustration." Whether it was the already-in-progress review or the lawsuit, which Hutchins says bore her name mostly because she was the team captain, conditions for Michigan State's women's sports started to improve long before the litigation had run its course in court. Women received equal per diems, comparable practice time, improved locker rooms and transportation and lodging upgrades. "It was simply the right thing to do," Simon says. "Some pushing and shoving occurred to get changes implemented." For her own part, Hutchins says she felt a mixture of emotions as she battled an institution she represented as a student-athlete. "It was kind of exhilarating," she says. "It's very empowering to move forward with something you believe in." The case was settled in the 1980s, and Hutchins had won. By that time, Hutchins had taken her fight 60 miles southeast to Ann Arbor. "Go out there and play for the people who paved the way before us," Carol Hutchins says she tells her players. Hutchins got into coaching right out of college, assisting the legendary Gayle Blevins at Indiana for a season before crashing on DeBoer's couch while leading the Ferris State program for a year. 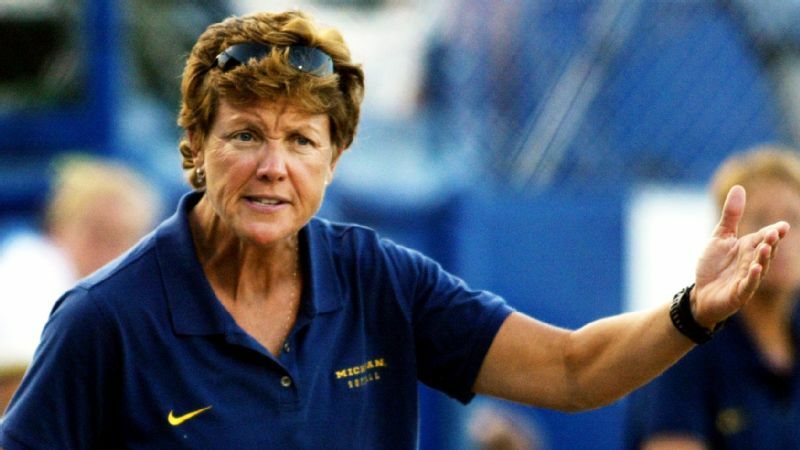 She was an assistant on the Michigan staff for two seasons before becoming the head coach. Ann Arbor in 1985 was a place and time where Title IX's impact wasn't exactly clear. Her position was considered part-time, so Hutchins worked two other jobs. She had just one assistant, also part-time, and Hutchins had to maintain the field herself. Looking beyond the diamond, she'd see the baseball team with a full grounds crew, full-time coaches and spotless uniforms. "The message was: 'You're not as important as them,'" Hutchins says. There was only so much she could do to remedy the situation. Michigan's athletic director at the time, Don Canham, opposed Title IX so strongly that he made trips to Washington, D.C., to lobby against it. As he told The Michigan Daily in 1975, "If you add a women's program, where does the money come from? If it comes at the expense of the men's program, you're going to have fewer sports." From facilities to budgets to coach salaries, women's sports paled in comparison to the men's. Pollick, the lawyer and lecturer, was a tennis player at Michigan at the same time Hutchins was at Michigan State. "It took quite a while and changes in the administration before compliance was achieved," Pollick says. Hutchins, on the advice of colleagues, kept her involvement in the Michigan State lawsuit from Canham. She knew plenty of coaches at other schools who were fired because of, they felt, their attempts to advocate for better conditions for female athletes. That's not to say Hutchins didn't fight. She just didn't complain. Despite calling the 1976 incident on the Michigan State basketball court a turning point, she remained someone whom others enjoyed working with. She didn't focus on the iceberg. "Hutch is not an angry flamethrower saying, 'We don't have this' or 'This is unfair,'" says DeBoer. "With her it was always, 'How do we succeed?'" That meant Hutchins, along with other coaches of women's sports, petitioning the university's administrators. "I was told by a female administrator to be happy with what we had," Hutchins recalls. "That was a common theme. We were constantly pushing." 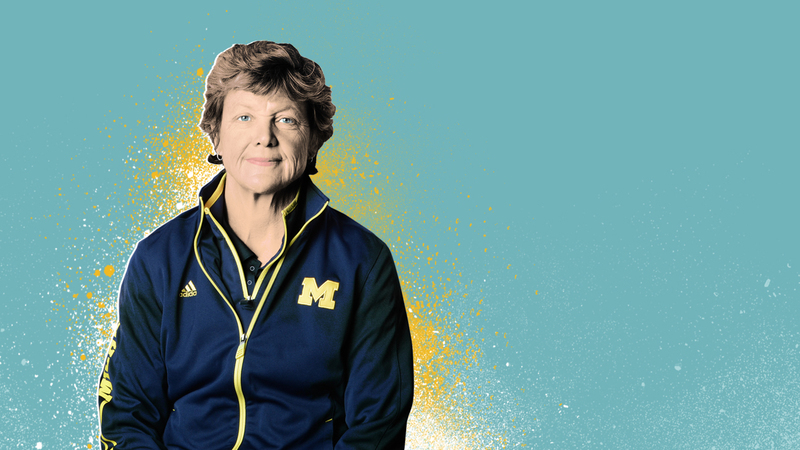 That persistence, combined with a change in leadership -- James Duderstadt became Michigan's president in 1988 and Jack Weidenbach started running the athletic department two years later -- led to improved conditions for female athletes. A few years ago, Hutchins used the phrase "Title IX" in talking to her team and a freshman -- God bless her -- asked, "What is that?" "I was aghast," Hutchins says. She made all of the freshmen write a one-page essay on the subject. When the Wolverines head north to Traverse City, Michigan, to begin an abbreviated fall schedule, they'll sit around a campfire and listen to a presentation from their coach on Title IX. They'll watch documentaries on bus trips. Team meals will be opportunities to discuss current events. "We learn something new about it every day," says rising senior Aidan Falk. "It's interesting to hear her point of view and cool to play for someone who is passionate about women's rights." 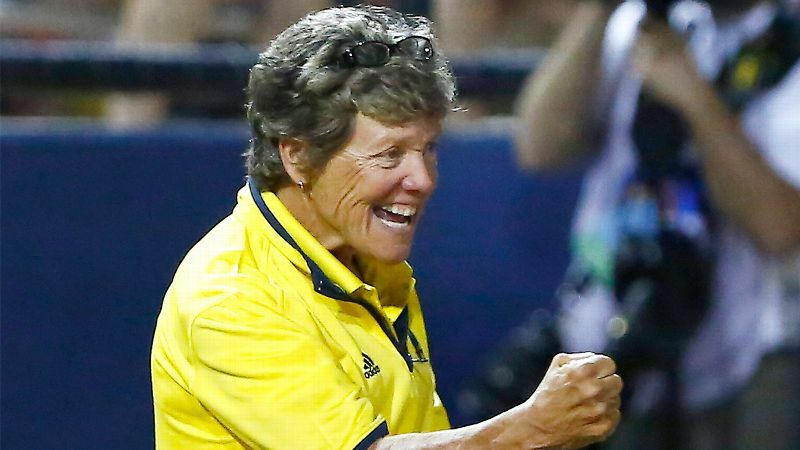 While Michigan's Alumni Field, among the best facilities in the country, has a grounds crew, Hutchins will make her players clean the locker room or sweep the dugouts every now and then. To play for her is to be grateful for the opportunity to be a college athlete. "Go out there and play for the people who paved the way before us," she tells them. The thing about history is, it doesn't just happen. It requires real people taking action. People like Carol Hutchins.